Whitney was incredible! She completed make up for me and my step-daughter for my wedding reception. Her sweetness makes you immediately feel at ease and comfortable. I typically don’t wear a ton of makeup, so I was nervous that I wouldn’t “look like me.” Whitney listened to my vision and comfort level and perfected it! She also did a beautiful job with my step-daughter. I was also shocked at how efficient she was with her time- we were done way faster than I anticipated, however I never felt like we were rushed. She’s just that good. I would HIGHLY recommend her and would personally use her again for any make up needs. Whitney was the best make up artist I have ever worked with. Her professionalism and talent far exceeded my expectations for my wedding day. She was so open and understanding as to how I wanted my makeup to look, and was so accommodating making sure I loved the look! I would recommend her to anyone wanting to get a fresh and timeless look for your wedding day!! Working with Whitney was wonderful. She is talented and so easy to work with. She's very responsive to feedback, and the looks she created for me and my girls were beautiful. I would highly recommend anyone to work with her, she will make you look amazing for your big day! Whitney was referred to me by two people and I was so happy I went with her for my wedding make-up. Whitney did absolutely amazing make-up for me and my 8 bridesmaids. Everyone looked so beautiful and she totally captured what I wanted for my big day. From initial outreach to trial to the wedding day Whitney was responsive, professional, so sweet, and fun to work with. She is so talented and was very organized and efficient on the wedding day. The bridal party loved their make-up and we received so many compliments from guests. The ladies that did our bridal hair had so many compliments about Whitney, saying she was simply amazing. They've already referred her to brides to be. Whitney is the real deal, I was so happy she was part of my big day. Whitney was recommended to me by my sister and I am so happy that I chose her to do my wedding makeup along with my bridesmaids. She has such a great energy and is professional and listens to what you want while sharing her ideas as well. Whitney and Sarah (hair stylist) are very talented at what they do. 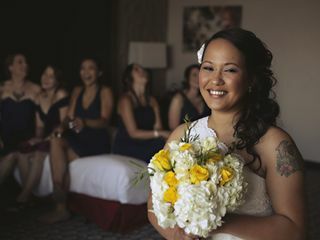 My bridal party looked amazing and when I looked in the mirror and saw the end result I was speechless, I felt so beautiful and confident on my wedding day. Whitney did my make up on my wedding day, as well as my bridesmaids' and my mom's. She made each of us look absolutely gorgeous without going over the top, and was very attentive to what we wanted while also contributing ideas of her own. The end result was that we all still looked like ourselves... just enhanced! Whitney is so, so talented. She uses high quality make-up that lasts all day and well into the night and looks beautiful both in photos and in person. I highly recommend Whitney's services! I hired Whitney Stassi Artistry and team to do my makeup/hair along with my 8 bridesmaids for my wedding. To say I was pleased with her services is an understatement. She and Dakota arrived 40 minutes early to set up (we started at 7am in Hood River) and started right on time, even a few minutes earlier than expected. She provided me with a day of schedule that was sent to me a month prior. We were on time all day and even finished a few minutes early. I felt as though she was a part of our bridal party. She is so sweet and easy to talk with. I felt extremely comfortable having her be with me on the biggest day of my life. Her makeup skills and professionalism is like none other I've seen. You will NOT be disappointed hiring Whitney Stassi Artistry for your wedding or any event. Best in the business by far!! I was a bridesmaid in my friends wedding in Oregon, Whitney did all of our makeup and I fell in love. She listened to exactly what I wanted and asked many questions as she went to make sure I was going to be happy. My lashes were amazing!! A few years later, I had to have her do my makeup for my Napa wedding. I did not do a trial run with her first because I trusted her work. She is a true artist!! Phone calls and emails were returned promptly and professionally. She traveled from Oregon and kept open communication with me about her travel schedule and made it a stress free experience. She arrived early morning of the wedding and set up her station. She has ALOT of amazing makeup!! Whitney made ALL my wedding makeup dreams come true! My entire bridal party, including my Mom felt so amazingly beautiful all night. She is professional, warm and easy to talk to (I now consider her a friend) and a make-up WIZARD! I would recommend Whitney in a heartbeat to any future bride near or far!!! SHE IS THE BEST!!!! I really cannot say enough about Whitney and her team. We paid for our wedding ourselves, and so we were very thoughtful about what we wanted. At the end of the day— I really wanted beautiful pictures, and I wasn’t entirely sure how much I wanted to invest in makeup and hair because I had an idea we could do it ourselves. Um, no. Just no. She is worth everything and more. Not only did she make myself and my bridesmaids gorgeous— she is exactly the right person you want to be with the day of your wedding. She was kind and perfect and amazing. I don’t know why I thought spending so much on pictures without her help was even an option. Whitney was a recommendation to me, and I really hope you hear me when I say I think she is the person for you. I don’t give recommendations lightly. She’s got this and honestly I really hope you feel as beautiful on your day as I did on mine. Thank you Whitney! I do not have enough kind words to say about Whitney. She was able to take the vision I had in my head for, not only my engagement photos but also my wedding day, and bring it all to fruition. She was flexible when it came to scheduling, she was attentive when I spoke to her about what I was looking for, and she was always punctual when it came to her arrival as well as the wedding day timeline. On my wedding day, she not only completed my look, but also the look of 5 bridesmaids, my mother, and my mother-in-law; all on her own and without a hitch. Additionally, she went above and beyond by helping me with my wedding day timeline when I was struggling to complete it. I would 100% recommend her to any bride. Whitney is not only professional, but extremely talented at her job and makes sure that your day is everything you dreamed of. She made my bridesmaids, my mother, mother-in-law and myself feel elegant and beautiful on my wedding day. Looking back at the photos you can see the joy on all of our faces, even after a night full of dancing and 100+ degree weather, everyone looked just as beautiful as they did right after their make up was done. She coordinates your trial run without a hiccup, and listens to your wants and needs to make sure that your makeup is exactly as you pictured. I would recommend Whitney to not only brides, but anyone looking for a wonderful experience to feel and look your best! Thank you Whitney, you are simply the best! Whitney is an absolute delight! She is friendly, professional, and most importantly extremely talented! 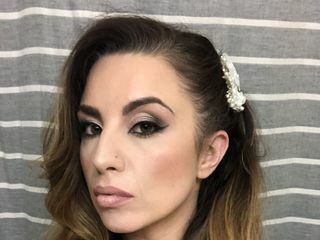 I have had the pleasure of her doing my make up on a couple of occasions, and when it was time to find someone to do my make up for my wedding there was no other choice! Highly highly recommend working with her! Whitney made my wedding weekend a dream come true. She did my makeup for both the rehearsal dinner and the wedding day and I've never felt so confident and beautiful. I don't wear a lot of makeup and was worried I wouldn't look like myself. Whitney was really sensitive about that and made sure I felt comfortable and natural. The morning of the wedding she arrived and was set up and ready to go with a smile on her face in what felt like minutes! She was ahead of schedule the entire day because weeks before the wedding she'd put together a schedule that I could send out to the girls ahead of time. This was SO nice because everyone knew in advance when they needed to get ready for makeup. Each time one of my besties got out of her chair I was even more stunned than the one before, and they were all super happy with their look as well. Whitney was one of my bridesmaids and having her do my makeup was one of the most special moments of my wedding day. Looking up at her and seeing her smiling ear to ear because she was so excited for me made me feel SO special and calm. Thank you for being an absolute pleasure to work with and have as a friend! I will continue recommending you to everyone I know! Following the stress of an artist cancelling on me, I was referred to Whitney. Finding her made me so happy that the other artist didn’t work out. Whitney brought my ideas to life and made not only myself, but my 6 bridesmaids feel beautiful. She was so sweet and made me feel very comfortable the entire process. Whitney is the sweetest and so talented! She did my makeup for my rehearsal dinner and my wedding day and I've never felt more beautiful! She listened to what I wanted and gave me the perfect look for both days. I highly recommend her!!! Everything I could have asked for! Whitney was the perfect choice for all things beauty for my wedding. She knew exactly how to bring my makeup vision to life. I’ve never felt as beautiful as I did on that day. She also had a hair stylist on hand who did a flawless job on my up-do. Whitney was fun, on time, laid back, meticulous, and knew what to do to make my bridesmaids, my mom, and me all look and feel gorgeous. I can not recommend her highly enough! I wish she could do my makeup every day!! Choosing Whitney for hair and make up for my wedding day was by far the best decision. The make up lasted the entire day with no touch ups - lashes didn't budge, lip color didnt smudge, and flawless skin coverage without feeling like it was caked on. Example and totally embarrassing but my make up lasted 3 days after the wedding, including the lashes, and now my license picture looks great :)...now hair is no exception, I've had my hair done by Jackie and Dakota (two different hairstyles) and both were phenomenal. The hair stayed in place without touch ups or additional hairspray. Whitney's experience allows her to easily understand the style you want without you having to overly explain, which makes the trial run fun and anxiety free. 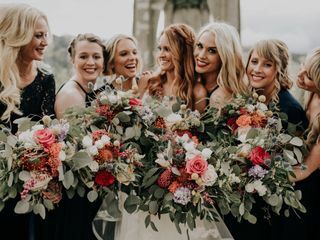 I was fortunate to also use Whitney's services while I was a bridesmaid in another wedding and her team is so efficient while still being detail oriented. In both cases, we (bride and 8 bridesmaids) had hair and make up completed ahead of schedule. You will not regret choosing Whitney. Every bride wants to feel stunning and beautiful on her wedding day, not only as she is walking down the aisle but also in pictures that she will have for years to come. Whitney is so talented. She has an incredible eye and gift for makeup artistry, I look back on my pictures to this day and am convinced there is no one else that could have made me feel more beautiful. On top of her talents as a makeup artist, she is timely and professional in her responses and scheduling. I never wondered or waited on Whitney to get back to me, she made the process so seamless and simple. Best of all? Whitney treats you as if you are a long time friend. All my bridesmaids and myself felt so comfortable around her and had the best time laughing and talking with her on my wedding day. Whitney is and will continue to be my strongest recommendation, she encompasses professionalism in every single aspect and will help you have the most memorable experience on your big day. I cannot say enough good things about Whitney!! 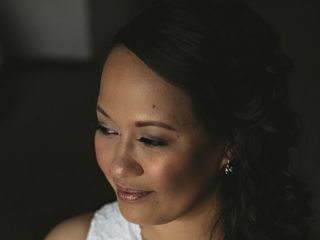 She was amazing and I would recommend her to any bride looking for professional makeup. Her office is beautiful, she made me feel so comfortable and confident, and her work is amazing. My whole bridal party was thrilled with her and all raved about how awesome she was. She uses good quality product and really listens to what you want. The day of she was early, very organized and she worked well with other vendors (like hair and photography). This gal made my day so much better and I can't thank her enough, and my makeup didn't move all night! 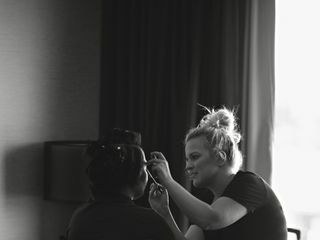 I have had Whitney do my makeup many times - Just for fun, date nights, my engagement photos, and for my wedding day (bridesmaids too - who all loved her - such a fun day)! Not only is she the sweetest person, but she is also a super talented artist!! She is organzied and timely, providing a detailed schedule (for my big day) and was always right on track, which helped everything go smoothly. She listens and makes everyone feel so comfortable. She has ALWAYS made me feel so beautiful! To be really honest, I wish she could do my makeup every day! Whitney is very passionate about her craft and it shows! I highly recommend her services! 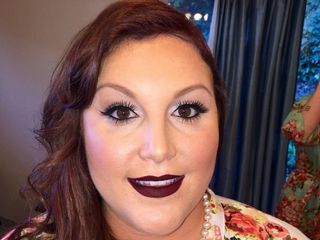 Whitney did makeup for the entire bridal party for my daughter’s wedding. She is very talented in making everyone feel and look beautiful. Because of her work, the wedding pictures turned out great! I highly recommend Whitney for her professionalism. She was a joy to work with! I'm one of those brides that "doesn't wear a lot of make up" so it was very important to me to make sure I was comfortable with my wedding day makeup. I choose The Blushing Bide package (engagement, trail run and day of makeup). Whitney nailed it and was a pleasure to work with! Not only is Whitney incredibly talented, she is super professional and an overall joy to be around. She showed up at the exact time she said she would the day of my wedding and naturally, my bridesmaids were running late. Even though she was pressed for time she managed to make myself and eleven other women look better than ever, all while blending in as one of the girls. I would highly recommend Whitney to anyone, and hope I can come up with some sort of special occasion to work with her again! Whitney has always been the makeup artist of choice for any event! !